First of all, since this is my first post here, I would like to introduce myself. My name is Jesse, 19 years old, I'm from the Netherlands and I study Animal Management. I am greatly interested in anything related to insects and I'm currently trying to figure out a way of producing Wax moths that is suitable for any size of operation. N. Marston, B. Campbell, and P. E. Boldt (Mass producing eggs of the Greater Wax Moth, Galleria mellonella) state that they used plastic sheets coated with sugar for the moths to lay their eggs on. This way they were able to produce up to 1 million eggs per day. Right now I'm also using these sugarcoated plastic sheets, but I can't get the moths to lay their eggs on the sheets. What am I doing wrong? The temperature is 25-30 c, RH 40% (I tried 70-80 before and this didn't help either). There is about 12 hours light a day. The second thing I found myself struggling with is that the waxmoths I rear produce silk. The ones I buy from the store don't produce any 'silk.' What can I do to stop them from producing silk? I tried cold treatment and this seems to work for as long as they are in the refrigderator. Woodshavings do not seem to affect silk production. I really hope that somebody can help me with this, and I would be forever thankfull if anyone knows the answer! Hi EntoJesse, - If you are not already doing so 1st crumple the sheeting, then make it flat & lay it out. Moths like to oviposit (lay eggs) on those lines fractures left from creased up things. Hello Gringojay, as that is a really good suggestion, I don't know if that could work for me, as I'm using cheap 'placemats,' or do you think that even a few linefractures will do the job? I will surely try this! As for the silk production, I think I solved that one.. It seems that when I put the waxmoths in the freezer (-18) for 10 minutes, the larvae survive but become much more slower (hence the difference between activity in bought larvae and home-reared larvae) and seemingly do not produce any silk anymore. Hope this also helps anyone else having this problem. Note: I tried putting them in the refrigerator for 1 and 2 days but this didn't help. Also, 5 minutes in the freezer also didn't stop them from producing silk. Again EntoJesse, - Your store bought fellows are probably hosting a microbe like Heterorhabditis bacteriophora or fungi like Hirsutella thompsonii. As these colonize the wax moth they interfere with silk production. I didn't know about that. I did notice however that egg production of the waxmoths I bought from the store was VERY little. Are they purposedly added or..? And are they of any danger to a larger scale operation? Little update: waxmoth larvae exposed to extreme cold (-18) for 10 minutes still don't produce ANY silk after 2 days. Are there any other people on this forum rearing Waxmoths by the way? Hi EntoJesse, - in the bee hive Galleria mellonella have substances from the wax & yours may be a missing factor responsible for low egg production. See if you can get some waste bees wax from a honey extractor. 40 years ago the wax worm larval rearing diet was (by volume, not weight) 12 parts of baby food cereal ("Gerbers"), 1 part glycerine, 1 part honey & 1/2 part bees wax. This was in laboratory conditions of 70% relative humidity & 29* Celcius (84*Farenheit). You might try folding wax paper length wise a few times to make pleats (like an accordian) & hold the pleated wax paper from springing open with some tape or clip at the far edge. Let the pleating stay open enough so the females can drop down into the crevice to oviposit; kind of simulating a cranny in a bee hive. The sheeting arrangement you describe is vague to me. If it is reflecting light then that can influence the eye of some of the moths interferring with the "right" signal & only those which are positioned just right are going to try to land & lay their eggs. As for the question do commercial breeders inocculate their stock with microbes to keep them working silk; I don't know & maybe just your source has inadvertently been affected. More likely to me is that breeders deliberately use rearing methods to keep juvenile hormone levels elevated as long as possible; in order to hold back their stock at saleable stage. Sounds to me like you have cold induced dia-pause & the up-regulation of juvenile hormone is inhibiting pro-thoracico- tropic hormone which is stopping the silk production. A question to you is: Why do you want to stop them from producing silk ? My current diet consists of Whole wheat corns, glycerol, water, sugar, oats and soymeal I think. No bees wax or honey used and the larvae grow to max. size in 3-3,5 weeks. In the literature I posted they did not use bees wax and I would want to know how they did that and why it's not working for me? The accordion folded waxpaper I am currently using besides the plates. Thanks for the tip! As for the silk, the larvae that I need for the next generation will not get a cold treatment. However, the larvae that are for sale, I don't want them to spin coccoons or be so spun in the substrate that it's hard to get them out. I will post pictures of the oviposition-box in a minute or so..
Hope this clears some things up..
Hi EntoJesse, - once Galleria completes it's last instar the glands silk start to grow, although can not make any silk for the first 2 days. 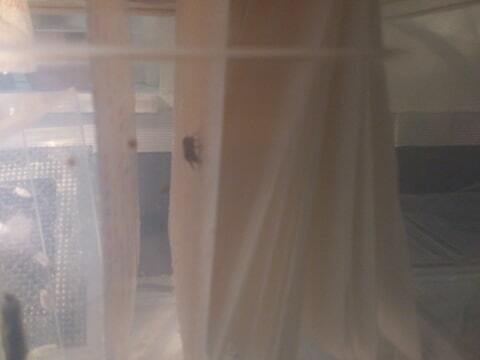 Beginning in another 1/2 day (day 2.5) they can potentially make silk for a total of ~ 5.5 days after their last instar. Ecdysteron hormone ("20E") at 5 micro-grams/ml holds down the silk making RNA; once ecdysteron levels rise to 5 nano-grams/ml the silk glands are stimulated to make silk. If you catch the larvae before ecdysteron level gets to 5 nano-gram/ml with a boost of juvenile hormone this stops the silk related RNA from up-regulating. In fact the actual silk gland itself then shrinks back into itself is subsequently broken down within about 3 days. On the other hand once the ecdysteron has risen to 5 nano-gram/ml the juvenile hormone can no longer cause the silk gland to be broken back down. Which means you want to inhibit the ecdysteron level from going up very much. The way to get to the ecdysteron before the last instar is over might be to alter the larval diet at the "last" moment. You are wanting to keep your larvae like they were a "big baby" - adult in size & yet still juvenile. Phosph-inosit-ide 3-kinase (PI3K) signalling is what holds down ecdysteron levels & if you up-regulate PI3K at the right time that might carry over for the normal silk days. PI3K is well known in human metabolism as part of the insulin signalling cascade; although also involved in other obscure cellular functions & that (rather than facilitating insulin) has the side effect of inhibiting ecdysteron in insects. My suggestion is to try timing a dietary switch as if you wanted to provoke hyper-insulin in a human; namely load them with "sugar" (glucose). In this way the reaction to excessive insulin called up to deal with the extra-ordinary glucose load will create a feedback loop to PI3K that more of it (PI3K) better be transcribed (made) to allow the organism to adapt. In a bee hive the waxworm will have access to honey & I would not be surprised to find a portion of their colony are quorum sensing how many are too many. Concievably some are self-medicating on honey to sustain juvenile hormone levels in order to let others make optimal use of the hive for cocooning. Maybe a late stage diet shift to higher ratio of "sugar" is how commercial operators keep their stock young (juvenile) long enough to unload on a customer. This would explain why those your bought never spun silk - their level of ecdysteron RNA got shorted out before a key threshold; PI3K directly mediated that inhibition (not insulin, nor the "sugar" molecule so probably don't have to boost ratio of honey specifically ). edit 1st sentence to read "... silk glands"
That's a great tip! I will try that out for sure. 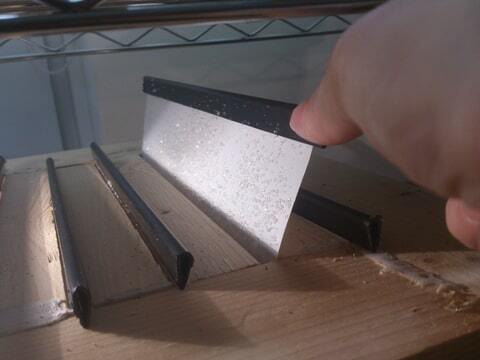 As for the egg-laying, the suger coated plastic sheets work great. I was just being stupid and thought I didn't need to dissolve the sugar to see the eggs L-). I now have one more question: why does everyone add glycerol to the diet? I know this keeps the substrate from drying out, but it's a rather expensive part of the diet. In a commercial rearing facility I wouldn't mind 'spraying' the substrate every other day to keep the substrate from drying out..
Hi EntoJesse, - Glycerol is hygro-scopic & is soluble with "salts" (minerals). It's low molecular weight make it enter cells readily & in the insect artificial rearing diet specifically increases the water they absorb; improved water going into cells also carries ions that are important. Although initially counter-intuitive, glycerol makes the cereal components in the diet less "sticky" from the sugar ingredient (wash with glycerine soap & note how non-sticky & cleaned off the skin feels); in the bee hive wax worms would not have cereal items sticking to their honey to deal with. Larvae generally make little glycerol, but in pupal molting they produce a good deal more; in diapause induced by cold (wintering over) huge levels of glycerol are made. It prevents ice crystal damage to the insect version of blood, hemolymph; it's hygro-scopic property acts like an anti-freeze (trehalose is another insect anti-freeze). In the case of pupation cold is not the issue. Glycerol in conditions that are not very cold is produced to cope with stresses from osmotic changes & things like internal cellular temperature stress (even human cells must deal with "heat shock proteins"). It stabilizes the cellular proteins during changes going on inside the pupae; glycerol's level during pupation is not fixed at a constant level & thus the amount any one insect makes alters over time/temperature. Thank you once again for your clear answer! It's clear to me now that glycerol plays an important role in the diet. But as I look at my 'recipe' and see that it uses ~210 grams of glycerol per kg, I wonder if that isn't a bit over the top? Maybe I can replace some of the glycerol by water or another ingredient? Because this amount of glycerol takes away quite some Kj per KG diet, which might make the diet less 'efficient'? Hi EntoJesse, - I don't know why glycerol was 1st chosen for lab rearing of waxworms & how the proportion was/is decided upon. Yet only looking at Kj/Kg efficiency is probably not the way to determine glcerol's contribution. Larvae fed labled form of glycerol had it 79% of it show up within 4 hours incorporated into tri-acyl-glycerides & the di-glyceride content of the insect hemo-lymph was made up from 90% of that labeled glycerol. In other words dietary glycerol is made into tri-acyl-glyceride, which is a fatty acyl ester made from glycerol ( synthesized as an esterified di-glyceride). Without glycerol in the diet the insect will make di-glyceride. However, this is energy costly because to make di-glyceride the insect must either break apart a phospho-lipid, use the glycero-phosphate pathway to make phosphatic acid, use the mono-acyl-glycerol pathway or pirate di-glyceride by de-acetylating an existing tri-acyl-glyceride molecule. In the fat body storing energy as glycogen (form of glucose) takes up a lot of space because it must be held hydrated; which is good for making into quick trehalose for flight or when insect is no longer feeding. But 90% of the fat body energy storage is as tri-acyl-glyceride, which is less bulky because it is held in an-hydrate form. Once the tri-acyl-glyceride is taken apart for energy that process spins off twice the amount of water molecules as does when glycogen is utilized. Larvae fed glycerol will lay more eggs & during development it seems the water is crucial to gamette production; in contrast a larvae deprived of water that becomes an adult can try to ingest more water yet they will still lay less eggs. Furthermore, trying to be-latedly give glycerol to an adult female that had been glycerol deprived as a larvae still results in those glycerol deprived larvae females in laying less eggs. Hi Gringojay, this makes the importance of glycerol even clearer to me, thank you! edit above double post where says "...79%" it should read 70%. Hi EntoJesse, - A bit more about glycerol you might want to look into. One of the things it does is protect the insect cell(s) from hypoxia (low oxygen) - which could be why glycerol is elevated in pupal states' lower oxygen exchange. If the inside of a bee hive is relatively low oxygen then wax worm larvae may have a higher basal level of glycerol than other insect's out in the wild larvae; but I don't know if this is the case. Hypoxia causes member proteins of heat shock protein familys ("Hsp") to trans-locate into the nucleus; although heat shock proteins are also found in the mitochondria & endo-plasmic reticulum (making them integrated into protein folding, some causing improper & some adaptative folding). Among other things the family of Hsp 70 is involved with micro-tubules, Hsp 90 family is involved with with actin & tubulin, while Hsp 60 family is involved with cytochrome c.
Heat shock gene's messenger RNA (mRNA) are selective. Some of the heat shock proteins can keep inactive mRNA capable of translation ; thus phased in ecdysone up-regulates small heat shock proteins (not Hsp70) giving tolerance to heat, which we assume pupae must passively cope with. Protecting the insects from hypoxia is very interesting to me, as this might open up opportunities for the depth of the substrate. Would it be possible to use substrates with a depth of up to 15-30 centimeters? Allright, so right now I'm having big troubles with finding a way to separate the waxworms from the substrate. Does anyone now a PRACTICAL way to sort out ~8000 waxworms every week? This does not include picking them out one by one..
Another thing that I'm struggling with is that I still can't get the waxworms to stop spinning silk. I tried adding sugar at the first days of i7 and putting them in the fridge for 3 hr's at 1 degree celcius. Thanks gringojay! 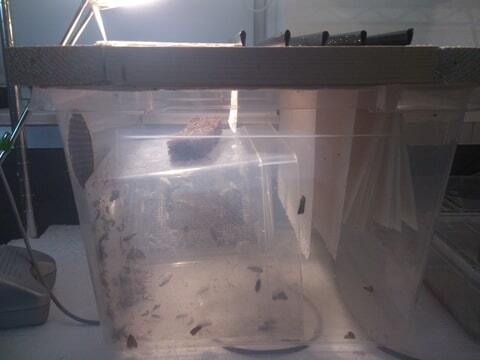 I tried that method, but tapping my enclosures does not seem to make the waxworms come up. However, does the patent imply that the waxworms come to the top of the rack, or do they go deeper into the rack where they fall out? Because the 'surface' of a beehive is not something that is set in stone to me..
Hi EntoJesse , ..... 10inch-ounces is 720.08 gram-force per cm; akin to a displacement of 0.72 cm for every Kg of bin weight. This done at 10 taps per second is a whole lot of torque ( 600 times a minute jostled all about) where the larvae will be shaking around & (according to the patent) they try to escape from their unstable surface. My recollection of the patent says some will just go to the rim of the encloser & need to be swept off their perch for collection. I get wax moths in my beehives periodically, never enough to be a problem. But, it would be easy for me to get local individuals to start a colony. One question, do they need honey? Can sugar be substituted? The reason I ask is because honey is expensive. I usually don't see the grubs in the honey part of the comb, anyway. They go through pollen and the brood, mostly. They seem to eat more wax than actual honey or anything else. I'm wondering if honey is a necessity. Hello @VelaCreations, I do not use honey in my diet. I use sugar as a substitute and quite a bit of glycerol. I have not tasted them yet, but I will try them for sure in the future. They are currently sold in a few supermarkets in the Netherlands in the form of a hamburger. Maybe you could try that? @VelaCreations, @EntoJesse - waxworms are by farm one of the tastiest bugs we've ever tried here at Tiny Farms. They are mild, with a sweet bacon like flavor when fried or toasted. Regardless of whether they ever turn out to be economical for commodity rearing, I think there will be a strong niche for their cultivation for culinary use. If I were to open a restaurant featuring insects, wax moth larvae would be my go-to.